So we're having a big, fat, Catholic wedding. All the tradition, etc. And we love it. But, in order to do that, we have to go through a fairly comprehensive marriage prep process with the church. J and I consider our church ceremony to be the main attraction of our wedding. The meat and potatoes, you know? So, I couldn't very well have a wedding blog without writing about how our ceremony came to be. Many people know nothing about Catholic weddings other than the fact that they're really long. So I'm hoping this will be interesting new information for some readers. Some other brides out there are just getting started with this process, so I'd like to share my experiences with the hope that they help those brides. First, let me say that J and I love our Catholic faith. It's really important to us. It unites us, and we both feel like we wouldn't be where we are today without the help we've received from God. Getting married in a Catholic ceremony was never a questionable thing when we began planning the wedding. 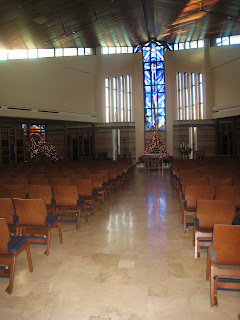 The Chapel we'll get married in! When I first went to the church to get started with our marriage prep, I was SO excited. You know that stage where you just like to say to people "I'm engaged!" and shine your ring in their faces? Yeah...I was still in that stage. I wanted a wedding date, and the first step was setting it up with the church! I was expecting something welcoming, congratulatory, and churchish-friendly. What I got was basically a checklist of items we had to complete (and pay for!) before we could even talk about the actual wedding. I'll be honest. I love the Church, but I was dissappointed. All the red tape! All the expenses! All the hoops to jump through! I felt like the Church was somehow making us prove that we could be a successful couple. I felt like the Church doubted my ability to choose the right guy for me. For what may have been the first time in my life, I felt just a little bit let down by my religion. In the Catholic Church, marriage is a sacrament. Just like baptism. It's a covenant with God, and it should be protected. It's not just a legality, it's not just a promise, and it's not just a public declaration (I realize that some people believe marriage is nothing more than a legality. Or a promise. Or a public declaration. Or some combination of the three. And for those people, getting married in a Catholic Church would make absolutely no sense. But for us, marriage is something more, which is why we're going through the Catholic marriage preparation process). Marriage is all of those things, but in the Church it's also something holy, something sacred, and something that shouldn't be taken advantage of or used irreverently. So, the Church protects it. They protect it by ensuring (to the best of the Church's ability) that the marriages it performs last. It seems like the Church is making it hard to get married, but really the hoops to jump through and the red tape are set up to support engaged couples, and help them use their engagement to grow and strengthen their relationship. The Church isn't trying to make us prove that we're capable of being a successful couple. However, it is trying to give us the most support it possibly can, so our first few years of marriage are as successful as possible. The rules are there for a reason, and now that I've had some time to think about them, I think I like them. Marrying J is the most important thing I'll do in my entire life, and I want it to be taken seriously, approached as something sacred, and protected. Without the Church putting some restrictions on marriage, my marriage wouldn't seem as important to me, and for that reason, I'm 100% okay with jumping through hoops. Our first item on the checklist was the "FOCCUS" test, a compatability questionnaire. It's up next in Part II!